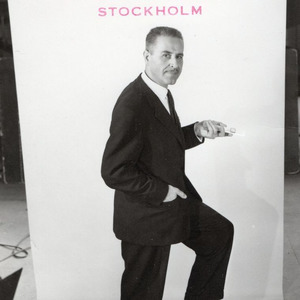 Albert ”Abbe” Andersson was employed as the Art Director at the news agency Svenska Telegrambyrån and later at Ervaco in Stockholm. Later on in his career he was also an advertising photographer, taking pics for, among others, Alfa Romeo, Essem Stängsel and the soft drink Sun Fresh. He was also celebrated abroad, for example in 1955 in the German magazine Graphik with the headline ”The smile of Albert Andersson”.